Boundary disputes are not usually very pleasant, so it's a good idea to prevent them from happening in the first place. The best way to do this is to check that the boundaries have been legally recognised, when you first move into a property. If they have not been recognised, it may be worth acquiring the services of a construction surveyor, to carry out the work. You may choose to just accept that the fence between properties is the actual boundary. If this turns out not to be the case in the future, you could be in for a nasty shock. Many people choose to extend the property where they live, in order to save on the cost of moving. If your neighbour decides to do this, and you think they have built across the property boundary, you need to take action. The first thing you should do is check to see if the property boundary has been legally recognised. If this is not the case, you can ask your neighbour to hire a professional to carry out the work. If it's found that your neighbour has built across the boundary line, you can seek legal representation, to take the case to court. It's important to point out that taking a boundary dispute to court should be a last resort. It's usually better if you and your neighbour can reach an amicable agreement. After all, you have to continue living next door to each other. If you are not able to get a satisfactory solution to the problem, the case should be taken to court. The court may decide to change the boundary line, award compensation or ask for the construction to be re-designed or removed. Taking this action means that you have a legal solution to the situation. The decision of the court is legally binding, so there can be no arguing about it. Of course, this may not be the end of the problems with your neighbours. Court cases can escalate animosities, so you need to be prepared to weather any stressful fallout. As you can see, disputes over property boundaries can be divisive, when it comes to neighbour relationships. Ideally, you do not want to fall out with your neighbours, so you should think about defining property boundaries soon after you first move into a property. 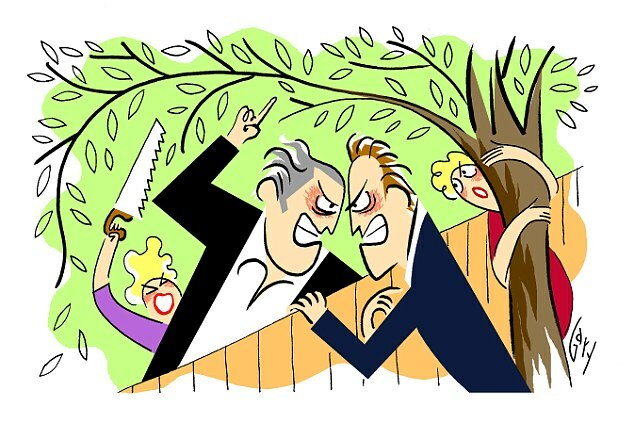 Of course, this is not the only potential cause for a dispute with your neighbours, but it's a significant one. In most cases, the fence or wall between properties marks the boundary line. But, in some cases, this construction may have been built in the wrong place. Knowing where you stand from day one helps to prevent issues from occurring. If you cannot prevent the dispute then try and make the resolution as amicable as possible, without giving way, if you are in right.